Anna Chapman is the Associate Dean (JD). She joined the Law School after a period of practice. Her research focuses on inequality and discrimination in work relations. She has written about the National Employment Standards, General Protections (Adverse Action), unfair dismissal law and anti-discrimination law. Anna is a past Editor of the Australian Journal of Labour Law, and a Co-Director of the Centre for Employment and Labour Relations Law in the Law School. 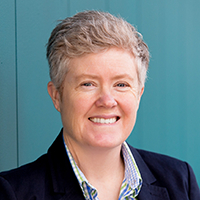 Dr Chapman holds Bachelor degrees in both Commerce and Law (with Hons) from the University of Melbourne, an LLM from the University of Melbourne and a PhD from the University of Adelaide (with a Dean's Commendation for Doctoral Thesis Excellence). Dr Chapman has authored over 80 scholarly publications, including more than 25 refereed journal articles, 10 book chapters and a co-edited book. Her work is published in leading national as well as international peer-reviewed journals. A study published in 2012 ranked her as no. 20 in a list of 'Most Prolific Publishers in the Go8 University Law Reviews (Excluding Home Review)', and as no. 21 in a list of 'Overall Most Prolific Publishers in Leading Australian Law Journals (Excluding Home Review)': R. Smyth, 'Who Publishes in Australia's Top Law Journals?' (2012) 35(1) University of New South Wales Law Journal 201-245 at p 239 (table 6B), at p 241 (table 7). Dr Chapman has been successful in obtaining eight competitive research grants, including five from the Australian Research Council.